Meet the new Knight Rider. 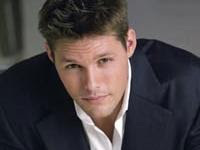 "All My Children" hunk Justin Bruening who is set as the lead in NBC's two-hour movie "Knight Rider," a "Transformers"-inspired sequel to the 1980s series about a man and his talking car. Justin Bruening's "TV dad on All My Children" is actor Michael Knight Michael Knight is currently married to "One Life To Live's" Catherine Hickland (Lindsey) Hickland who's first husband was David Hasselhoff who used to play Michael Knight on the original Knight Rider Got it!